The smartphone navigation app Waze has released its international 2016 Driver Satisfaction Index. In those rankings of 38 countries where Waze has more than 20,000 monthly users, El Salvador was dead last. San Salvador was ranked 184th out of 186 metropolitan areas. The Waze rankings included a variety of metrics such as traffic, road quality, road safety, access to services like gas stations and parking, auto and gas prices, and general driver satisfaction. No argument from me on these rankings. El Salvador Gangs Wielding More Weapons of War. El Salvador's security forces have been coming across increasing numbers of automatic assault weapons in the hands of gangs. Many of these weapons were originally used in El Salvador's civil war. El Salvador Announces New Anti-Impunity Unit. El Salvador’s attorney general announced the creation of a new anti-impunity unit in the prosecutor's office that will work on politically sensitive corruption cases and have strong backing from the US government, although it lacks direct international participation. The cases include an arms trafficking case against the country's current ambassador to Germany who was formerly defense minister. On June 3 of this year, the Constitutional Chamber of El Salvador's Supreme Court ruled that El Salvador's horribly overcrowded prisons violated the country's constitution and the human rights of incarcerated prisoners. The court ordered a series of corrective measures be taken. El Salvador's prisons have the capacity to hold 8000 prisoners, but they currently hold 37,000 prisoners, not counting the 5000 held in local police jails. The head of El Salvador's prisions says there has been no significant investment in the prisons in the last 50 years, some of which date back to 1904. Implementing measures to substitute for incarceration might reduce the prison population by only 3000 prisoners. As El Salvador celebrates its Independence Day this week, I thought I would share a bit about the country's flag. 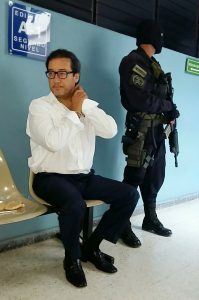 The former Attorney General of El Salvador, Luis Martinez, has been freed on $5000 bail pending his tiral on charges that he had illegally divulged intercepted communications of Father Antonio Rodriguez (Padre Toño) . Martinez had previously received the right to release on bail for charges that he had engaged in a corrupt conspiracy to use his office to benefit businessman Enrique Rais. Many anti-corruption crusaders were indignant, but because I come from a country where bail for criminal defendants is common, I don't have a problem with the decision (although maybe the bail should be higher than $5000). Still, the decision to free Martinez stood in stark contrast to the detention of Wendy Morales, a young actress and human rights activist, who is being held in provisional detention without bail in a case of extortion, where the only link between Wendy and the crime is that a cell phone that was stolen from her had links to the extortion calls. Traveling through El Salvador, I have come across many local tourism projects. They may feature a small museum, or a "casa cultural" or a path to a local geological feature like a waterfall. The ones with museums are usually collections of artifacts from the war, collected by ex-combatants, hoping to share their memories and perhaps earn a few tourist dollars. It has been one year since I last wrote a blog post about gold mining in El Salvador and the international arbitration commenced against El Salvador by Oceana Gold (formerly known as Pac Rim). It has been two years since the final hearing in that arbitration. It has been seven years since the arbitration started. Now there are statements floating around that a decision by the arbitration panel is imminent. According to some reports, the parties have been told that a decision could come in September and that the decision has been written but simply needs to be translated into Spanish. It was also reported that OceanaGold recently approached El Salvador with a request to negotiate over the dispute but the overture was rejected. A recent public opinion poll by La Prensa Grafica reveals the views of Salvadorans regarding crime and policing in their country. With regards to crime, 13.7% of those polled reported that they or someone in their family had been the victim of a crime in the preceding three months. Of those who had been victims, however, 64% did not report the crime to the police. Presumably those victims either believe that reporting will do no good or that there will be reprisals against them if they make a report. Despite the majority of victims not reporting crime to the police, Salvadorans have a positive view of the National Civilian Police (PNC). 54% have a positive view of the PNC compared to only 21% with a negative view. These results were obtained yet 16% of Salvadorans report that they have been mistreated by the police at some point in the past. Luis Martinez was arrested along with Salvadoran businessman Enrique Rais. Rais has a number of business interests including the operation of El Salvador’s largest landfill. The allegations against Martinez and Rais involve prosecutorial and judicial corruption in which Martinez accepted favors from Rais in return for protecting El Salvador’s king of solid waste. 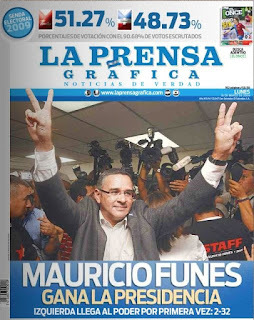 Many of the dealings between Rais and Martinez had been previously described in reporting by investigative journalist Hector Silva Avalos who publishes the online journalism site RevistaFactum.